Because he was 12 years older, Jacob Bernoulli often called his brother “my pupil.” This was meant to imply that Johann did nothing on his own, but only repeated what Jacob had taught him. It is utterly implausible that a mathematical formula should make the future known to us, and those who think it can would once have believed in witchcraft. And in the narrowest limits no limit in here. What joy to discern the minute in infinity! The vast to perceive in the small, what divinity! The Bernoulli brothers were two of the first mathematicians to study Leibniz’s new calculus (published in 1684). Johann became well known as a teacher who could explain this confusing but powerful new math. The first calculus textbook ever published (in 1696) was based on Johann’s lectures — although the author did not acknowledge this, claiming the credit to himself. This of course made Johann mad. But then, jealous Johann often got mad. But just as much as it is easy to find the differential of a given quantity, so it is difficult to find the integral of a given differential. Moreover, sometimes we cannot say with certainty whether the integral of a given quantity can be found. Johann Bernoulli had three mathematical sons. The greatest of these was the middle son, Daniel. In 1738, Daniel published his most important work, Hydrodynamica. Johann was so jealous at his son’s success that he wrote and published a similar book the next year. But Johann put a false date on his own book, to make it look like it had been printed five years earlier. He tried to convince people that Daniel had merely copied his book. There is no philosophy which is not founded upon knowledge of the phenomena, but to get any profit from this knowledge it is absolutely necessary to be a mathematician. 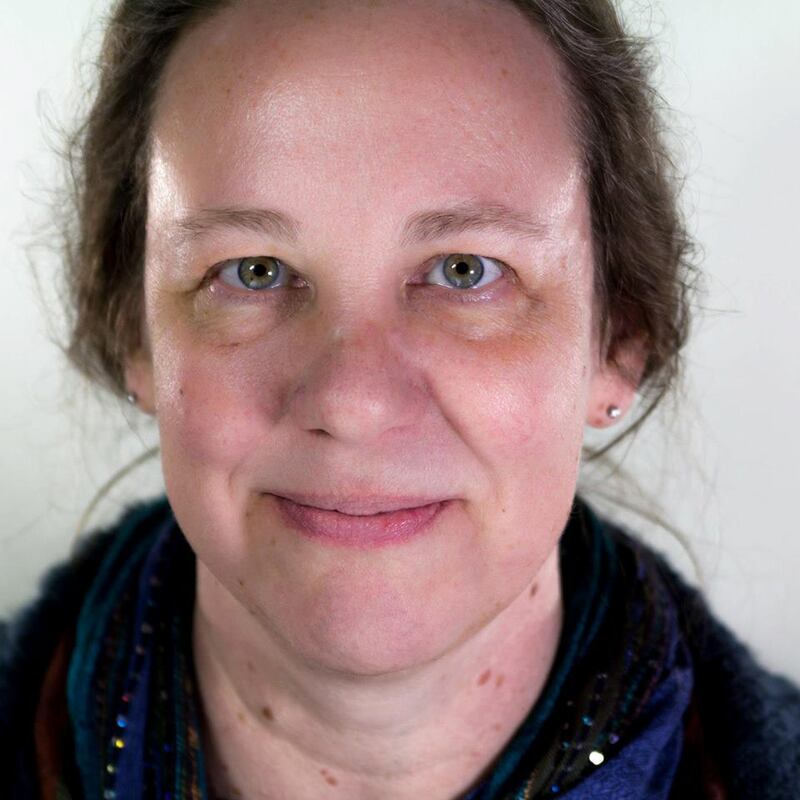 A funny thing about the Bernoulli family is that the fathers kept trying to get their sons to go into business, law, or the church — anything but math! Johann’s eldest son, Nicolaus II, was his father’s pet. Daniel’s younger brother, Johann II, and his son, Johann III, liked math, too. The latter was a true prodigy, teaching at the Berlin Academy at age 19. Johann’s youngest grandson, Jacob II, taught at St. Petersburg (where his Uncle Daniel had worked for several years with the famous Leonhard Euler) and married a granddaughter of Euler’s. 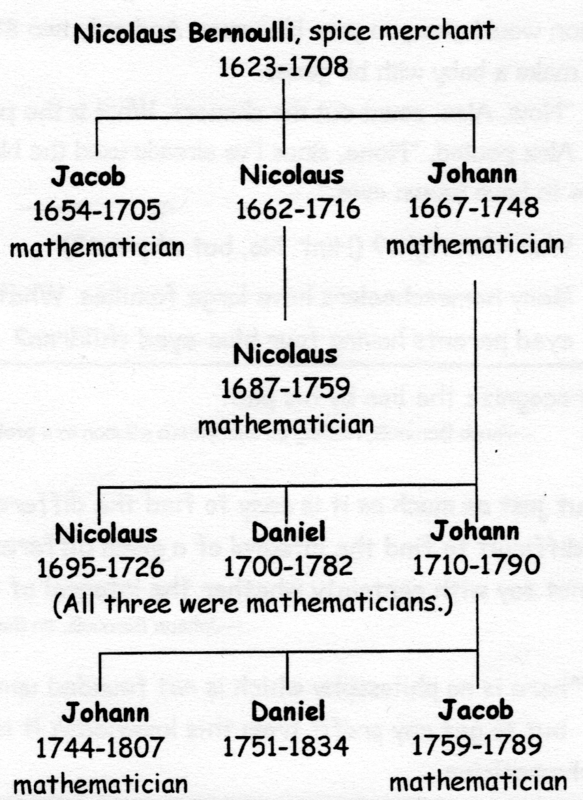 Jacob and Johann had a nephew, Nicolaus, who studied probability and edited Jacob’s book Ars Conjectandi. Nicolaus the nephew (Daniel’s cousin) used Jacob’s Law of Large Numbers to estimate the probability of having a boy baby as 18/35, or about 51%. * William Dunham, The Mathematical Universe. Read all the posts from the July/August 1999 issue of my Mathematical Adventures of Alexandria Jones newsletter. Yeering Yacob and Yealous Yohann. I thought about that as I was retyping this for the blog post. In their day, it’s quite possible that both of the brothers pronounced their name with a “Y” sound, rather than our Americanized “J”.